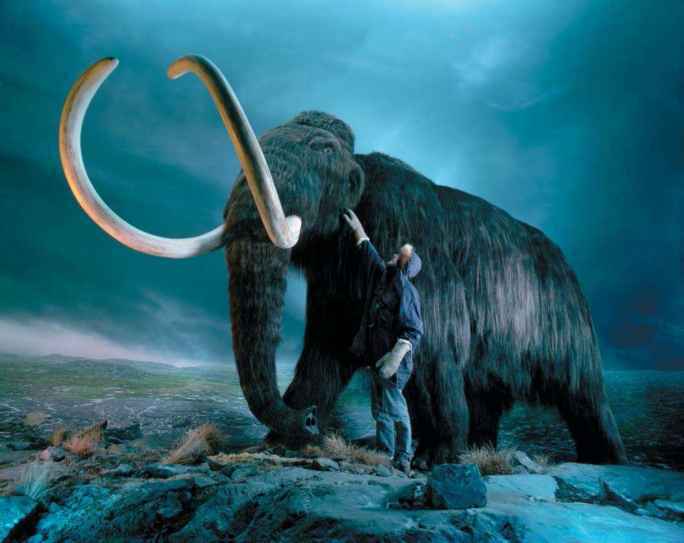 During the latter half of the Ice Ages, the Pleistocene, in response to the slow pulsation of continental glaciers, there evolved unique large mammals—man included. In their biology and appearance they diverged from anything seen earlier in the long Tertiary, the Age of Mammals. They did not merely adapt to the increasingly seasonal climates and greater extremes in temperature and moisture. Rather, in the sheer exuberance and breadth of their adaptations, they reflected both the new ecological riches and soil fertility generated by glacial actions as well as the long successions of biomes they evolved in prior to life in the face of glaciers. Their novelty resides in novel opportunities and seasonal resource abundance in the environments shaped by these glaciers. It is this which gave rise to their oddness in shape and biological eccentricity, which shaped many into giants, and which ushered in the Age of Man. The Pleistocene epoch is the latter half of the Ice Ages and is characterized by major continental glaciations, which began about two million years ago. There have been about 20 of these. 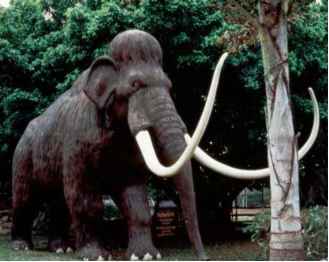 Minor glacial events building up to the major glacial periods characterized the latter part of the Pliocene epoch. The evolutionary journey of mammalian families that succeeded in adapting to the cold north began in moist tropical forests. It proceeded stepwise into tropical savanna, dry grasslands at low latitudes, and then either into the deserts or into temperate zones at higher latitudes and altitudes. From there it continued into the cold, but fertile environments formed through glacial action and on into the most inhospitable of cold environments: the tundra, the alpine, and the polar deserts. Such extreme environments developed with the great continental glaciations that cycled at roughly 100,000 year intervals between cold glacial and warm interglacial phases. There was massive ice buildup in the Northern Hemisphere during the former with a concomitant shrinkage of oceans and severe drop in ocean shorelines. During inter-glacials there was glacial melt-off, followed by a re-flooding of the ocean to roughly the current level. We live today towards the end of an interglacial period. The well-differentiated latitudinal climatic zones we take for granted are a characteristic of the Ice Ages we live in; during the preceding Tertiary period there were tropical forests in what are today polar deserts. Consequently, adaptations to the extreme environments of the Ice Ages are relatively new. Species adapted to cold and glacial conditions are new because the environments generated by huge continental glaciers became extensive only in the Pleistocene. That was new. Habitats formed by small mountain glacier are, of course, old, but large glaciations allowed the spread of what once were rare ecosystems. Also new is a sharp climatic gradient between equator and poles, generating latitudinal successions of bio-mes with increasing seasonality, terminating in landscapes of glaciers and snow. Glaciers are "rock-eaters" that grind rock into fine powder. This ground rock is spewed out by the glacier with melt water and flows away from glacial margins as silt. When the seasonal glacial melting declines and the freshly deposited silt dries under the sun's rays, it turns to fine dust which the winds blowing off the glaciers carry far, far away. Glacial times are dusty times. In the ice cores from Greenland glaciers, the glacial periods are characterized by their dust deposits. This wind-born dust is called by the German term "loess." The ecological significance of glacial dust lies first and foremost in its fertility. Loess has high pH levels. Where it falls day after day it forms into the fertile loess-steppe. Silt and loess are deposited in lakes and deltas. After the lakes drain, there remain fertile deep-soils deposits. These Pleistocene loess and silt deposits in Eurasia and North America, as well as the ongoing deposition of glacier-ground silt along major rivers such as the Nile, Mekong, or Yellow River, are not merely today's grain baskets, but the very foundations of great civilizations. The silt and loess deposits form rich virgin soils, unleached and undepleted of their soluble mineral wealth. These young, fertile soils foster rich plant growth wherever there is sunshine and moisture. 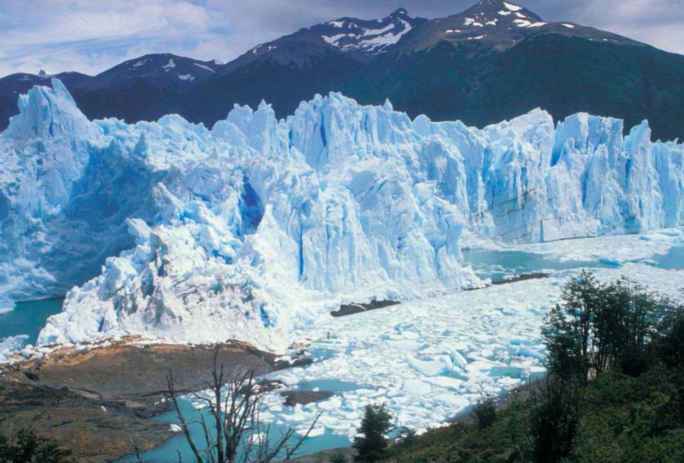 Glaciers generate their own climates. They foster katabatic, that is, warm winds blowing away from the glacier. On the melt-off edges they foster clear skies and sunshine. We still see such climates along the ice fronts of the large mountain glaciations in the western Yukon and Alaska, along with abundant, diverse, and productive flora and fauna. Glaciers are not hostile to life. carnivores. The inorganic sulfur is converted in the gut by bacteria into sulfur bearing amino acids, cysteine and methionine, the primary amino acids for the growth of connective tissues, body hair, hooves, claws, horns, and antlers. Salt licks are avidly visited by lactating females and by all during the shedding and re-growth of a new coat of hair. They are essential for the growth of luxurious hair patterns and huge horns and antlers. These "evaporite lenses" are covered by more and more loess, becoming part of deep loess deposits. When water cuts through such deposits forming steep loess cliffs, these evaporates attract big game which gradually dig deep holes into loess cliffs. The Pleistocene loess steppe is a haven for large grazers due to its fertility. It has been called the "mammoth steppe" based on remains of woolly mammoth associated with it, as well as an "Artemisia steppe" based on the fact that many species of sage thrive here. This fertile steppe was also home to wild horses, long-horned bison, camels, reindeer, saiga antelopes, giant deer, and wapiti, as well as wolves, hyenas, lions, saber-toothed cats of two species, and several species of bears. We may also call it the "periglacial" environment. It was extensive during glaciations. During the interglacial warm periods, without the fertilizing effect of glacial silt and loess, the acid tundra, alpine, polar deserts, and boreal forest were prevalent. Thus the development of diverse cold environments, some greatly affected by glacial actions and seasonally quite productive, invited the colonization by new types of mammals able to cope with the biological riches and the climatic hardships. The evolutionary progression towards Ice Age giants begins in the tropical forests with old, primitive parent species that are, invariably, defenders of resource territories. They are recognizable as such by their weapons, which are specialized for injurious combat: long, sharp canines or dagger-like, short horns. Property defense is based on expelling intruders by inflicting painful injuries that also expose the intruder to greater risk of predation. Both males and females may be armed and aggressive. 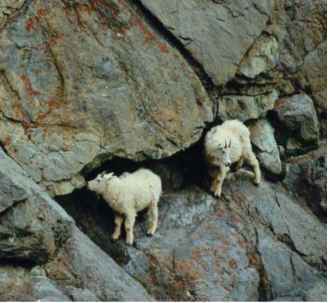 They escape predators by taking advantage of the vegetation for hiding or climbing and are excellent jumpers that can cross high hurdles. In the subsequent savanna species the "selfish herd" becomes prominent as a primary security adaptation against predation. This is associated with a dramatic switch in weapon systems and mode of combat. That is, as individuals become gregarious, they fight mainly via wrestling or head-butting, and minimize cuts to the body that could attract predators. They also evolve "sporting" modes of combat, sparring matches, in which there are no winners or losers. This is a novelty permitted by the new mode of combat. Moreover, relative brain size increases, probably as a response to more complex social life. With adaptation to greater seasonality the species evolves the capacity to store surpluses from seasons of abundance into seasons of scarcity. That is, individuals develop the capacity to store significant amounts of body fat. Their reproduction tracks the seasonal growth of plants, whether triggered by rain falls or seasonal temperatures. Their mode of locomotion changes to deal with the predators of the open plains. They may evolve fast running, without giving up their ancestral ability to jump and hide in thickets. As evolution progresses to the wide-open, grassy steppe, the plains-adapted species evolves capabilities to deal with low temperatures. Seasonal hair coats evolve. Because of the rich seasonal growth of forage, individuals experienced a "vacation" from want and from competition for food, evolving ornate hair coats and luxurious secondary sexual organs. This tended to go along with an increase in body size. Consequently, by the time species evolve in the cold environments close to continental glaciers, they may be giants of their respective families as well as their most ornate, brainy, and fat members. We may call these new Ice Age species "grotesque giants." They are exemplified by woolly mammoth and woolly rhino, the giant stag or Irish elk, the moose, caribou or reindeer, Przewalski's horse, Bactrian camels, the extinct cave bear and giant short-faced bear, and extant Kodiak and polar bear, and, of course, our own species, Homo sapiens. Compared to other species within our family or tribe, we are indeed a grotesque Ice Age giant. Indeed, two human species adapted to the glacial environments—the extinct Neanderthals and ourselves. Note: every Ice Age giant is the product of successful adaptations to a succession of climates and environments from tropical to arctic. Thus, they have a wide range of abilities built into their genomes. The progression of species from primitive tropical forms to highly evolved arctic ones is well illustrated in the deer family, as is the varied nature of gigantism. Moreover, in the deer family both subfamilies of deer follow the very same evolutionary pattern. In the Old World deer it begins with the muntjacs, small tropical deer from southern Asia with one or two pronged antlers and long upper combat canines. They are largely solitary territory-defenders that escape predators by rapid bounding (saltatorial running) followed by hiding in dense cover. They are a very old group dating back to the mid-Tertiary. differ in external appearance, nevertheless the identity of their body plan is readily apparent. The most gregarious forms have prominent visual and vocal rutting displays. The third step in the progression is represented by the four-pronged deer. These are adapted to temperate climates with a short, mild winter. Only two species are alive today, the fallow deer and the sika deer. Besides the increased complexity of antlers, there is a stronger differentiation and showi-ness of the rear pole. While the three-pronged deer have a showy tail, the four-pronged deer have a rump patch in addition. That of the sika deer consists of erectable hair that may be flared during alarm and flight. These are highly gregarious deer with very showy vocal and visual displays. The fourth step is represented by the five-pronged deer, all of which are primitive Asiatic subspecies of the red deer. They are found in regions with a distinctly harsher, colder, and more seasonal climate than the preceding four-pronged deer, including in high mountain areas of central Asia. These deer have progressed still further in the differentiation of the antlers, body markings, and rump patch and tail configurations. They are also much larger in body size. An evolu-tionarily advanced branch of red deer of some antiquity is the European red deer. These feature complex five-pronged antlers, a neck mane, and larger and more colorful rump patches. The fifth step is represented by the six-pronged deer—the advanced wapiti-like red deer of northeastern Asia and North America. These are the ornate giants among Old World deer. They are much more cold-adapted and extend on both continents beyond 60°N. They occupy periglacial and cold montane, sub-alpine habitats, are more adapted to grazing than other red deer, and have a body structure similar to plains runners. They have the largest rump patch and the shortest tail, the greatest sexual body color dimorphism, and the most complex rutting vocalizations. 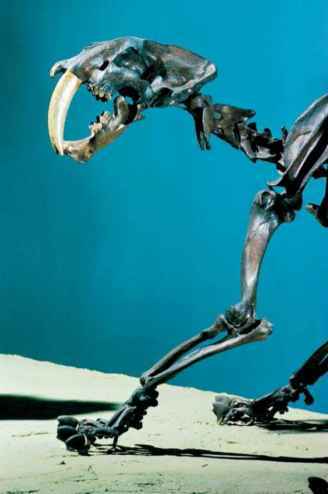 Of the same evolutionary rank as the six-pronged wapiti was the now extinct giant stag or Irish elk. It grew the largest antlers ever and was also the most highly evolved runner among the deer. Besides the enormous antlers, it had a hump over the shoulders, a tiny tail, and probably had prominent body markings judging from cave paintings. It was a resident of the fertile glacial loess steppe and proglacial lakes. Of the same evolutionary rank among the New World deer are the moose and the reindeer, both found in extremely cold climates. In South America, in the cold southern pampas formed from loess, cold and plains adapted deer also evolved enormous reindeer-like antlers. They are now extinct. Among the primates only the hominids leading to Neanderthals and modern humans have gone through a similar mode of evolution. Humans are the only primate that has been able to penetrate the severe ecological barriers posed by the dry, treeless steppe. That is what allowed them to spread into and adapt to northern landscapes. To conquer the treeless steppe humans had to be able to escape predation at night on the ground. They had to provide continually high quality food to gestating and lactating females irrespective of the season. Besides evolving the capacity to store very large quantities of body fat, which became a prerequisite of reproduction, they developed means to access the subterranean vegetation food stores encased in hard soils during the dry season. 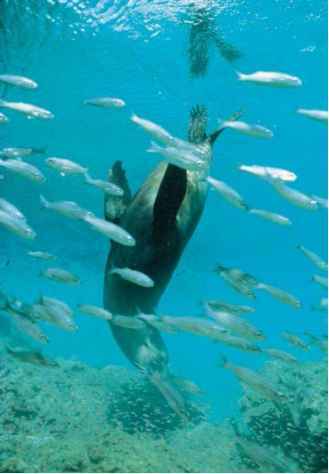 They successfully exploited the rich food resources of the inter-tidal zones and estuaries. Through hunting, they tapped into the rich protein and fat stores of the large mammals on the steppe. As the capacity to kill large mammals evolved, weapons developed that could stun opponents rendering them unable to retaliate, and cultural controls over killing augmented ancient biological inhibitions. This is a profound adaptation, and is thus biologically unique and not found among other mammals. The distinction between doing what is right and wrong must thus go back to the roots of tool and weapon use about two million years ago. which must have led to a maximum spread of deserts in Africa, Homo sapiens arose out of Homo erectus by adapting to deserts. Two branches survived to invade and thrive in the periglacial zones of Eurasia, the enigmatic Neanderthals and the modern Homo sapiens species. We can thus trace the rise of a "grotesque giant" primate—ourselves. Man is large in body, ornate in hair pattern and secondary sexual organs, and evolved a very large brain. Our reproductive biology depends on large stores of body fat, and we evolved highly sophisticated displays based on vocal and visual mimicry. Finally, we developed an insatiable urge to artistically modify everything we were able to modify, which led to culture. We are thus part and parcel of a greater evolutionary phenomenon, that of the Ice Age giants. However, the tropics too produce giants, represented among primates by the larger of the great apes, foremost by the gorilla and orangutan. Tropical giants built on primitive body plans are, invariably, "coarse food" giants. Small-bodied mammals have a high metabolic rate per unit of mass compared to large-bodied mammals. This is related to the fact that to keep a constant core-temperature of about 98.6°F (37°C), which is essential for optimum enzyme functioning, small mammals must burn more fuel per unit of mass than do large mammals. Small mammals, because of the very large surface to mass ratio, lose heat rapidly compared to large mammals with their low surface to mass ratio. Consequently, a mouse must metabolize per unit of mass much more food than an elephant. In order to maintain the high metabolic rate required the mouse needs to digest its food very rapidly, compared to an elephant, and must consequently select only rich, highly digestible food. Elephants, by comparison, can feed on very coarse, fibrous food that may remain for some time in their huge digestive tracts. The same principle applies to tiny and gigantic tropical primates. The former feed on buds, flowers, fruit, insects, etc., while the gorilla feeds on fibrous, much more difficult to digest vegetation. The chimpanzee, which stands so close to our ancestral origins, is somewhere in between large and small, and its omnivorous food habits reflect that fact. Ice Age giants reflect totally different conditions. Their size depends, in part, on the large seasonal surpluses of high quality food during spring and summer. Large size, however, is also an option in insuring minimum predation. That is, a high diversity and density of predators, such as those that characterized North America's Pleistocene, generates gigantic herbivores with highly specialized anti-predator adaptations. Conversely, herbivores stranded on a predator-free oceanic island decline rapidly in size and loose their security adaptations. They become highly vulnerable "island dwarfs". Elephants for instance have shrunk to 3 ft (0.9 m) in shoulder height on islands. Oddly enough, large body size is not related to ambient temperatures in winter, despite the fact that the surface to mass ratio declines with body size, favoring heat conservation. This is the principle behind the famous, but invalid Bergmann's Rule. Contrary to its predictions, body size in the same species does not increase steadily with latitude. Rather, body size increases only to about 60-63°N and then reverses rapidly. That is, individuals of a species beyond 63°N become rapidly smaller with latitude, some, such as caribou and musk oxen reaching dwarf proportions closest to the North Pole. Lowering the surface to mass ratio as an adaptation to cold is so inefficient that the absolute metabolic costs of maintaining ballooning bodies outstrips whatever metabolic savings might be gained by the reduction in surface relative to mass. Bergmann's Rule has thus neither empirical nor theoretical validity. That predation plays a role in driving up body size is not only indicated by North America's Pleistocene fauna of gigantic predators and prey or the biology of island dwarfs, but also by the fact that the largest deer, the Irish elk, was also the most highly evolved runner among deer. For humans adapting to the dry steppe, hunting must have played a role in increasing body size, while periods of low food abundance favored a reduction in body size. However, by far the most striking attributes of the grotesque Ice Age giants are their showy, luxurious hair coats, secondary sexual organs and weapons, and their showy social displays. 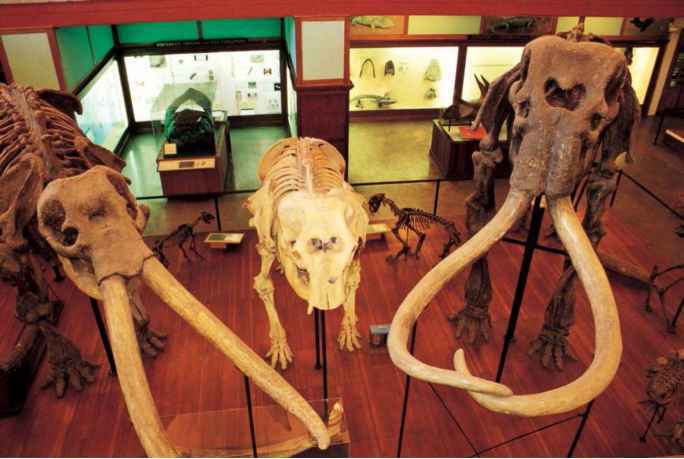 The enormous tusks of mammoths and their long hair coats; the huge antlers of Irish elk, moose, and caribou as well as their striking hair coats; the enormous horn-curls of giant sheep and bighorns; the beards, pantaloons, and hair-mops of bison and mountain goats; and the sharply discontinuous hair patterns and large fat-filled breast and buttocks in our species all stand in sharp contrast to comparable organs in tropical relatives. 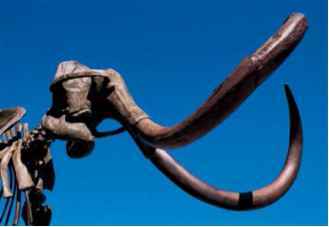 The great surpluses of food in summer do permit the very costly storage of fat as well as horn, tusk, and antler growth. However, seasonally abundant food is only a necessary condition for "luxury organs" to evolve, but not a sufficient one. The rise of animal behavior as a science has informed us about these luxury organs. Their size, structure, and distribution over the body, as well as the manner in which they are displayed during social interactions indicate that they are signaling structures evolved under sexual selection. Predation lurks in the background in some lineages, as illustrated by the way in which the gigantic antlers, horns, and tusks of northern plains-dwelling herbivores have evolved. well developed and quick to rise and run, a newborn needs to be born large in body and advanced in development. That, and the subsequent production of rich milk requires that the female not only have a high food intake, but take risks feeding in dangerous areas just to maintain a high food intake. She must also spare nutrients and energy from her body growth in favor of that of her child. What father must such a female choose so that her daughters may have the highest genetic potential to grow large babies and rich milk? Since the fathers contribute only their genes to the welfare of their children, they must—somehow—advertise their success at foraging and escaping predators. In the case of deer, any energy and nutrients ingested above the need of the body for maintenance and growth are automatically diverted into antler growth. Therefore, the better a male is at finding high quality food, the better its antler growth and the larger its antlers. However, high quality, uncontested food may be in insecure areas favoring predators. Therefore, the larger the antlers the more daring the male and the more able it is at detecting and escaping predators. The symmetry of the antlers is also a factor. Symmetry is a proxy for health. Therefore, the female should choose as a father for her daughters a male with very large, symmetrical antlers. If so, then the larger the antlers, the more males ought to advertise with their antlers during courtship. Therefore, the larger the antlers of a species, the larger and more advanced the newborn, the richer the milk, the better the parents are at high-speed running, and the more males flout their antlers in courtship. All of these expected correlations are found. What antlers do for deer, horns or tusks and elaborate hair coats do for other species that are associated with wide-open, cold, but productive Ice Age landscapes. These luxury organs evolve in relation to the security of newborns. Therefore, severe predation pressures ought to enhance the evolution of these luxury organs in plains dwellers. It is not surprising, therefore, that in Pleistocene North America, the large number of specialized predator species are associated not only with very large-bodied prey, but also with body structures in prey that enable speedy running, as well as immense tusks in mammoth, enormous horns in long-horned bison, and huge, complex antlers in the stag-moose and caribou. tion of fat over her body signals her fertility and health. In addition to breast and buttocks, which are shaped largely through triglyceride (fat) deposits, the density and quality of hair acts as sexual signals. Hair is formed from sulfur-bearing amino acids such as cysteine and methionine, which are rare and cannot be readily synthesized in our bodies in adequate amounts. Luxurious hair growth, formed from rare amino acids signals, therefore, biological success as it is based on the intake of high quality food. Our notion of beauty and grace rests in the first instance on symmetry of body features and function. Symmetry is a function of good nutrition. Our brain consists largely of fat. Its superior function depends on a rich and balanced intake of essential fatty acids. Even mother's milk reflects this demand as, compared to other species, it is exceptionally rich in brain-building omega-3 and omega-6 fatty acids. For superior growth and development, humans thus require omnivorous food sources fairly rich in fats that contain these essential fatty acids, such as the fat of wild game, fish, and seafood. In the Upper Paleolithic of Europe humans reach exceptional physical development and brain sizes; the archeological record indicates that their food was primarily reindeer and salmon. Neanderthal, the human super-predator, reached earlier comparable brain sizes living off the largest of periglacial herbivores, woolly mammoth, woolly rhino, giant deer, horses, and steppe bison. The cerebral cortex is a tissue of low growth priority. That is, it grows to maximum size only under exceptionally favorable food intake, provided of course that it is also well stimulated daily through an active social life and adventures. 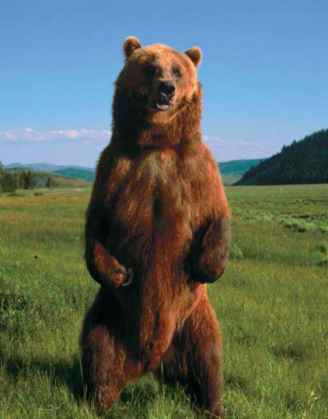 There were many Ice Age giants in the periglacial environment: huge beavers; enormous bears such as the carnivorous short-faced bear of North America or the cave bear of Europe or the current Kodiak brown bear and the polar bear. 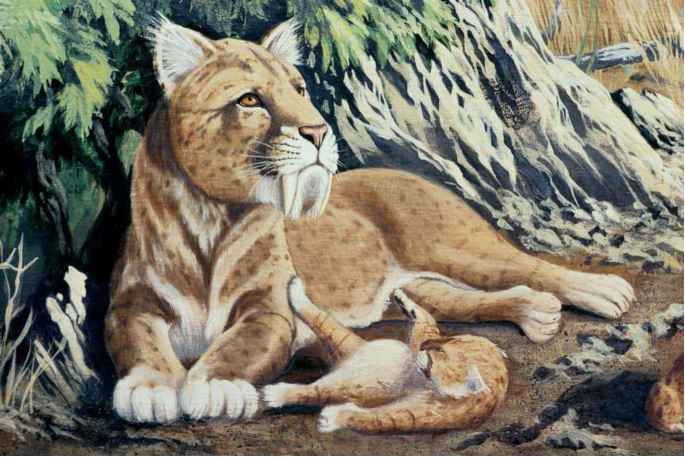 Northern cave-lions and cave-hyenas reached body sizes twice the mass of their African relatives, as did the American Pleistocene cheetah compared to the African or Near East forms. And, of course, humans reached maximum body and brain dimensions in the periglacial landscapes. Why then did these large-bodied forms not grow larger still? We get a glimpse of the answer for our own species by looking at what Neanderthals did. Neanderthals, exceptionally robust and powerful, with huge joints in arms and legs and massive bones, approached us in height and were probably equal in body mass. As supercarnivores they specialized in the largest and hairiest herbivores, which were brought down apparently by one hunter skillfully tackling and attaching himself to the hairy exterior of his prey, while a second hunter jumped in to disable or kill the distracted beast. The tackled beast, however, must have gone through some violent rodeo-like bucking and jumping to dislodge the attached first hunter. Consequently, dislodged hunters would have been catapulted through the air followed by harsh landings, often on frozen ground. Not too surprisingly, Neanderthal skeletons reveal frequent bone breaks and the pattern of bone breaks resembles that of rodeo cowboys. Neanderthal hunters did not enjoy a long life expectancy, unlike the modern humans in the Upper Paleolithic that followed them. A body size larger than that attained would have placed the hunters at a disadvantage as it would have been more difficult to hold on, while falling off would have generated harder impacts and generated even more bone breaks. That is, as body size increases, it reduces mobility and acceleration, but increases muscular strength and impact force during a fall. If agility and acceleration are compromised at large body size, then the ability of hunters to evade attacks by large prey they antagonized or wounded is compromised. Furthermore, should there be periods of food shortage that strike during the growth and development of an individual, then the smaller-bodied individual has a better chance of growing brain tissue than a large individual. Small body size, while excelling at agility and acceleration, suffers from lower strength, maximum running speed, and endurance. Body mass is thus based on a compromise of factors that allow optimum performance in the tasks demanded by adaptation. The evolutionary road to periglacial environments is virtually a one-way road to herbivores and omnivores. There is practically no return of Ice Age species to habitats at lower elevation and in more benign climates, with a few exceptions. Ice Age herbivores must be generalists that can deal with a great diversity of seasonal temperatures and foraging conditions. They cannot compete against the food-specialists at lower elevations. These evolved to deal with the myriad of chemical and structural defenses of plants against being eaten by herbivores. Cold climate vegetation, by comparison, is much less defended in large part because much of it may be hidden under a long-lasting snow-blanket and unavailable for grazing. Moreover, Ice Age species are exposed to fewer parasites and pathogens than are species in warmer climates. Consequently, the diseases and parasites of more primitive warm-climate species can be devastating to Ice Age mammals. The tropics in particular are characterized by an abundance of microorganisms and parasites against which northern species have little or no immunity. Nevertheless, some species have succeeded in re-invading warm climates, humans in particular. That humans from high latitudes do have significant problems in the tropics is attested to by medical history. With the rise of humans to ecological dominance their fellow Ice Age giants did not fare well. Most went extinct, and though their passing is shrouded in controversy, the weight of opinion points to humans as the cause of their extinction. Human capabilities improved sharply between 60,000 to 40,000 years ago and the largest of the Ice Age giants began to fade then. Massive extinctions of the megafauns followed the last retreat of the glaciers. However, that was also a time of great hardships for humans, followed by the rise of agriculture, which brought some relief. Most of the Ice Age giants must have become victims of very hungry and very able human hunters. The Ice Ages generated new, increasingly seasonal and climatically harsh environments from the equator to the poles. Each Ice Age giant is thus the product of successive adaptations to ever more challenging landscapes. Each has the genome of ancestors that were highly successful in the tropics, in the savanna, in the steppe, in deserts, in cold-temperate zones as well as in the climatically extreme periglacial, arctic, and alpine habitats. They were thus constructed genetically with more and more abilities to cope with more and more challenges. That may be the reason why in the Pleistocene, and not earlier, there evolved the most uniquely gifted Ice Age giant of all: the modern human.